Healthy soil is alive, rich with an incredible diversity of living organisms from bacteria, fungus, protozoa, to earthworms and tiny insects. It is this living biological component that makes the difference between a healthy soil and a degraded soil. Substances secreted by these living organisms make mineral soil particle clump together, giving soil what we call structure. Soil structure helps soil contain pockets of air and water which help plants to grow and also allows water to percolate deeper into the earth. This provides better drainage in times of excess water and also stores water in times of drought. Healthy soil sequesters carbon in the form of soil organic matter and humus. Why are soils around the world degraded? What does this entail? To this date, about one third of soils worldwide are degraded. We are losing approximately 12 million hectares of productive land to desertification every year, an area roughly the size of England. This degradation is in part due to industrial agricultural practices (e.g. tilling, monocultures, chemical inputs) as well as deforestation, which inhibit life in the soil. A degraded soil loses its carbon content, which is largely emitted in the atmosphere as CO2, contributing to climate change. Indeed, the majority of agricultural soils have lost 50 to 70% of their carbon content. How can we regenerate soil health? Reduce or eliminate plowing and tilling Plowing and tilling are commonly used to loosen and aerate soil for planting as well as to control weeds. However these practices disrupt the soil structure and break the fragile networks of fungi which are so important to soil biology. They make soil vulnerable to erosion by wind and water and expose the soil microorganisms to sunlight. By reducing or eliminating these practices, we permit the soil biology to colonize in a safe habitat. Controlling weeds remains a challenge, which is helped by keeping the soil covered. Keep soil covered In nature, soil is never bare. There is always living plants or debris covering it. This helps to keep the humidity and temperature amenable to the biological life of the soil. In regenerative agriculture, soil is kept protected with cover crops (plants grown specifically between cash crops to cover the soil), with mulch (dry organic matter such as straw or wood chips) or by synthetic tarps. The most effective method is to keep living roots growing in the soil as much as possible. Use organic inputs and reduce or eliminate synthetic fertilizers and pesticides Synthetic fertilizers and pesticides inhibit soil biology, while compost, compost tea and microbial inoculants feed it. Soil fertility is built by using cover crops and green manure while shifting to organic inputs. Increase biodiversity and integrate perennial crops Monoculture crops are vulnerable to disease and adverse conditions. By increasing the diversity of species grown we feed the soil with a greater range of nutrients and take advantage of the beneficial relationships among plant species. This gives a greater resistance to disease, reducing the need for pesticides. It also builds resilience as some types of plants will survive better than others depending on the climate conditions. Perennial plants (trees, shrubs many grasses, fruits and vegetables) do not need to be replanted every year, disturbing the soil ecosystem each time. Their better developed root systems penetrate more deeply into the earth, thereby deepening the zone where water penetrates and carbon is sequestered. Regenerative agriculture advocates including a diversity of perennial crops as well as integrating them into annual crop production (agroforestry) to improve the soil biology, the water retention capacity of the soil as well as its capacity to sequester carbon. Holistic Integration of ruminant animals Ruminant animals such as cows and sheep have a unique capacity to digest cellulose and therefore provide one of the best opportunities to build soil in a temperate zone. Perennial grasses, grazed by herds of ruminants using a method called holistic managed grazing, have the potential to sequester large amounts of carbon. The animals graze, trampling plant matter into the earth and spreading their manure as they go. The dense herd is moved frequently to prevent overgrazing and to stimulate the rapid regrowth of the grasses. The current industrial meat production system has a very negative carbon footprint, causing many to say that the best thing we can do for the planet is to stop eating meat. But managed grazing is very beneficial and has a positive carbon footprint. How can regenerating soil health help mitigate climate change? 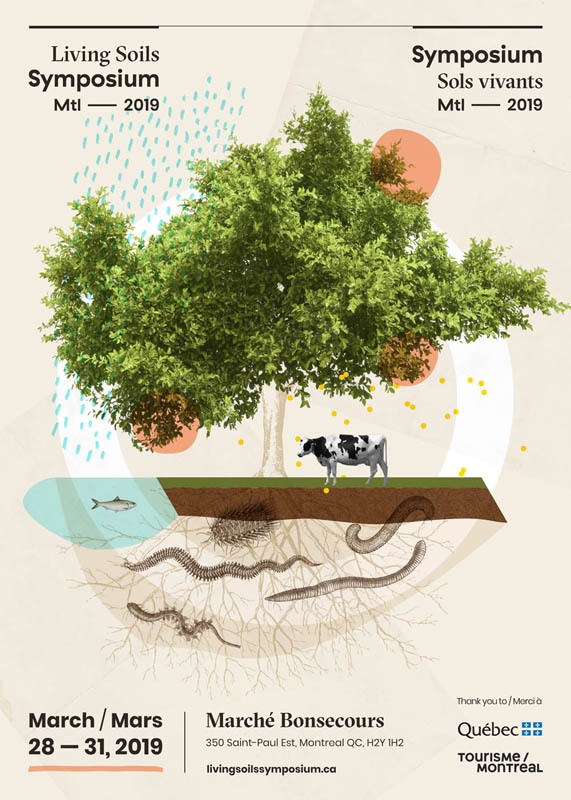 Soil regeneration restores the ability of healthy soil to capture carbon from the atmosphere and sequester it in the earth through the action of plants. By cutting greenhouse gas emissions alone we will never be able to meet our climate targets within the time frame necessary, according to the IPCC report issued in 2018. Once CO2 is in the atmosphere it stays there until it is removed. If we are to avoid catastrophic climate change (above 1.5 degrees according to the IPCC) we must look at solutions to draw the excess carbon out of the atmosphere, in addition to drastically reducing emissions. Photosynthesis is nature’s way of drawing atmospheric carbon into the earth. Plants breathe the CO2 and using the energy of the sun, transform it into liquid sugars which feed the soil microorganisms, which in turn help plants to grow. Carbon on the earth is in the form of biomass: the plants, the microorganisms, the animals, and us humans are all made mainly of carbon which is sequestered as long as we are living. When we die some of the organic matter goes back into gas, but some of it remains trapped in the earth. It is trapped deep in the ocean, in peat bogs, wetlands and also in the form of soil humus. The deeper the layer of living soil, the more carbon is sequestered. Living soil not only sequesters carbon, preventing it from returning to the atmosphere, it protects us from the effects of climate change. Well structured, healthy soil holds water and air, thus providing resilience to droughts and floods which are more frequent with climate change. 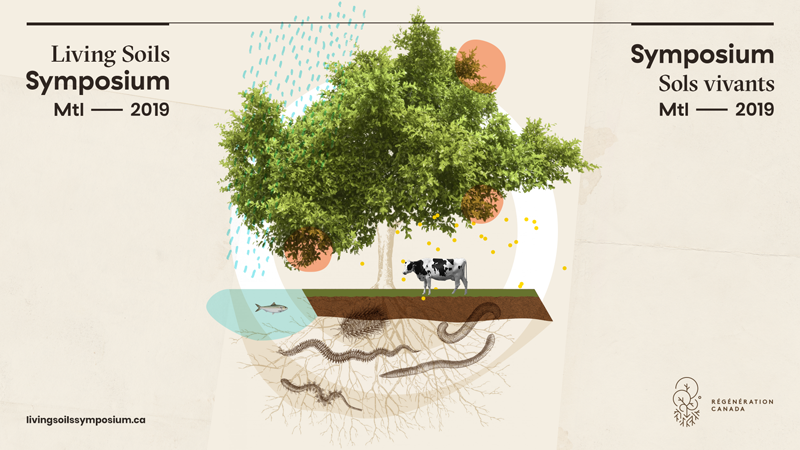 How can regenerating soil health feed the world? Who attends the Living Soils Symposium? The Living Soils Symposium is for all who want to play a role in soil regeneration. This includes citizens who care about the health and the carbon footprint of the food system; growers and agronomists who want to share about better methods to produce food while building soil; businesses who are supporting regenerative agriculture and lowering their environmental impact; policy makers who want to support a system where the economy and the environment are not at odds; researchers who are perfecting our understanding of how it works; as well as the artists and storytellers who communicate hope and innovation to the world. 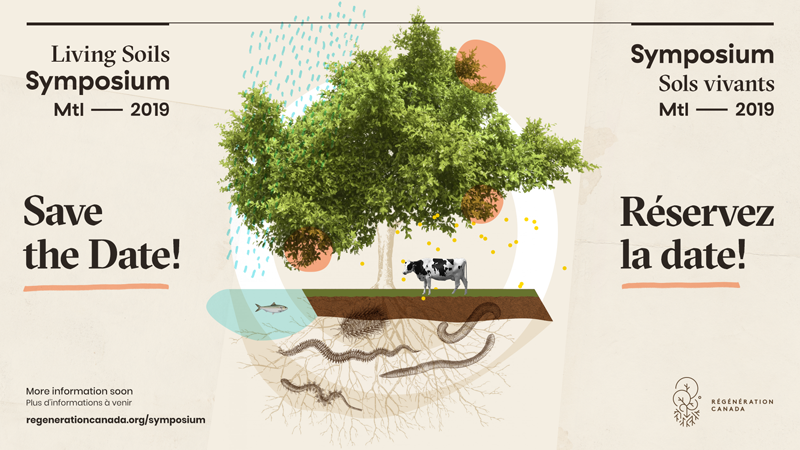 Why is the Living Soils Symposium not-to-be-missed? 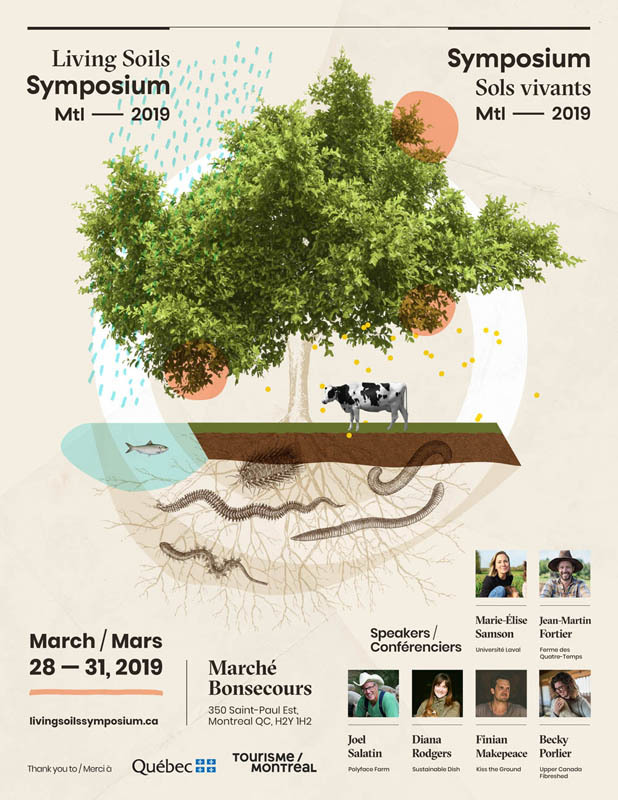 The Living Soils Symposium is a unique event which brings together diverse players who care about and have an impact on our food systems and about how our land is managed. 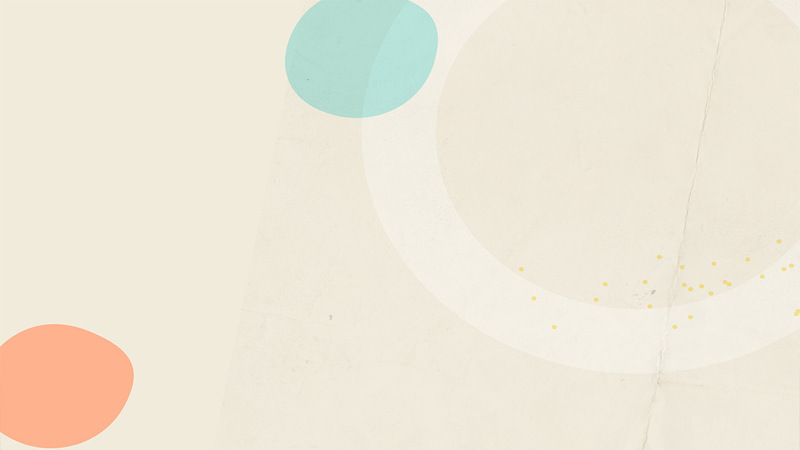 Experts will learn from each other and share their experience. The general public will learn more about why soils are important to our ecosystems and our survival. We are at a time in history where we require everyone to do their part to change how we live on this planet. We know that climate change is caused by human intervention into the natural ecosystems Together we must find ways to build a low carbon economy. How we manage the land and the soil ecosystem is critical in redesigning our food system, our cities and our businesses. The Living Soils Symposium is a forum to bring everyone together to stimulate innovation and change.